Patient education is key to higher patient retention, case acceptance, and even provides free word-of-mouth marketing. Not only that, but it provides the patient an opportunity to be a part of the diagnosis, the treatment, and the prevention, which allows you to establish a relationship and develop trust. However, patient education also requires one very important thing: communication. Emails and texts don’t count. 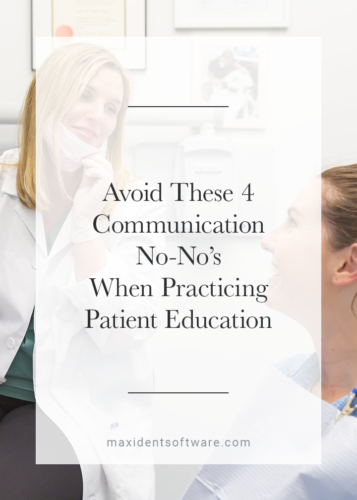 This is real, live one-on-one communication, so with this in mind, these are 4 communication no-no’s to avoid in order to practice effective patient education in your office. There seems to be a theme with every dentist I’ve seen that they just wanted to gather my personal as well as my medical information via a cold informal fill-in-the-blank form. I can’t tell you how unappealing it was to sit there in the waiting room with a clipboard on my knee, filling out information like I was registering for a credit card and not being taken care of by health professionals. To avoid patients feeling this way, don’t just use fill-in-the-blank forms; gather information of a more personal nature in-person. After visiting multiple dental clinics in search of the right one and coming up empty every time, I found the one that I am still loyal to today. Here’s why: Starting a conversation with me was the first thing the office manager did as soon as I stepped up to the front desk. And the best part? Before she handed me the form, she afforded me the opportunity to ask my own questions. She was kind, patient and willing to answer each one. Honestly, after that, I was more than happy to sit down in one of their comfortable armchairs to fill out the form. Developing a relationship with your patients takes more than just telling them to sit and fill out a form, it takes in-person effective communication from not just you but also your front office staff. A good educator understands that one of the most important skills to have is patience. Whether you’re a dentist, an office manager, a hygienist, or a treatment coordinator, if you’re providing advice, how-to’s or simply explaining a treatment, lack of patience could cause a communication breakdown. And seeing how communication is crucial to building a lifelong relationship and bond of trust with your patients, you want to avoid breakdowns at all cost. There is no doubt, it has become a lot more difficult. You’re up against incredibly short attention spans. We have so many distractions in our lives — the beeping and buzzing and chirping of our phones as they give us updates on games, notifications of who liked our comment on Facebook, and scoldings when we don’t meet our steps goal. Paying attention to any one thing has become difficult for the average person. Which is why you, as an educator and health care provider have to work harder and be more patient than you have ever been before. Be sure to prompt those attention-split patients to ask questions, ask them if they understand, and even provide them with other resources they would have easy access to. Practicing patience will not only help you avoid a catastrophic communication breakdown, it will actually strengthen the bond with patients of all ages. And those were just a few of the worst I’d heard. And though some of them might be false or severely exaggerated, that doesn’t stop the new patient from feeling terror as soon as they approach the doors. That’s exactly how I felt. Then, after visiting a few dentists, I realized something that made me not want to go back: they told horrific stories, too; they told these stories as a method of teaching. My advice: Do not do this. Your new patients are already terrified. Hearing even more horrific stories only increases the anxiety and fear and stress new patients are already feeling, making it impossible to think, never mind retain. Be kind, tell stories that are inspiring and uplifting, and educate with a smile. A smile is calming and stress-reducing. Trust me, your patients will be able to retain a lot more information if they aren’t already thinking of booking it out of there. This is a theme anywhere you go. For example, I dropped off my laptop with a computer technician to get it looked at and hopefully fixed. When I came back to get it, I wanted to know if what had crashed my laptop was due to something I did or if it was something out of my control. The question sounds simple enough, right? The technician began to speak and I just stood there staring blankly at him. I couldn’t understand a word of what he was saying. To me, it just sounded like gibberish. If you’ve been in this situation, you know what I mean. Here’s the problem with jargon: only you and your colleagues understand what you’re saying. Patients like me will just stare at you blankly, and if they are too shy to speak up, they will nod and only pretend they understand while all of your explanations go right over their heads. Keep it simple and clear. If the answer is complicated, just think about how you would feel were you a patient without all the experience and expertise you have. Your patient can’t retain information if they can’t understand it. Want to turn your practice into a successful, profitable business? Subscribe today to receive the best content about dentistry + awesome offers! Thank you for your interesting in Maxident! Get FREE tips to grow your Dental business! We hate spam, your e-mail is safe with us. What a tremendous, fair, honest, and helpful company. Their employees are patient, hard working and exceptionally understanding. Without the backing of all the support staff, I am sure I would have gone absolutely insane by now. We have been with Maxident since Maxident soon started. We had to change computer companies due to technology. The other company was excellent but things happen. What more can I say but this is a tremendous and exceptional family atmosphere/company. They CARE. Thank you Maxident for being there for me and with me for all these years. From growing offices to a Big office to a smaller office. You have been there all the way. Thank you so much Maxident. Tech support has been awesome in an office where time is everything! The program is very user friendly. Tech support is always available to answer any questions or assist if there is a problem. With 33 computers all using maxident it can slow the program down, however, the technicians at maxident have been wonderful in resolving the issue. Copyright © 2018 Maxim Software Systems. All Rights Reserved.